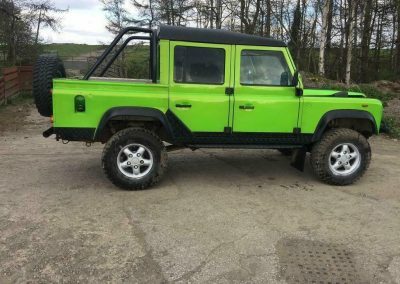 1993 Land Rover Defender 110 RHD Double Crew Cab with 200Tdi engine. Ideal donor vehicle for a custom SPECTRE 007 build or restoration, or use it as a daily driver as is. Stunning Kawasaki Green paint, very clean bodywork, chequer plated rear tub with roll cage, new clutch, solid chassis, bulkhead and footwells, tubular front winch bumber, Safari snorkel, upgraded front grill, rock sliders and diff guard. Starts and drives very well.